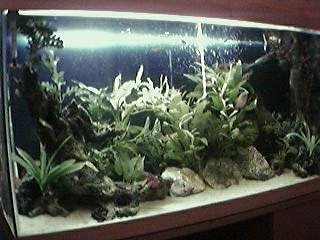 Tank Details: 3ft long 2ft deep built into a beech cabinet. The Fish: 5 Neon Tetras, 5 Kuhli Loaches, 2 Dwarf Gouramis, 2 Banded Gouramis and god knows how many guppies. Comments: Decorated with live plants and some fake logs and rocks.